Kathryn Winkler, left, Kira Ellis, AHS osteoarthritis practice lead, and Kathryn’s mother, Katharina, take a break between GLA:D program exercises at Crowfoot Physio in Calgary. It wasn’t long after Kathryn Winkler started driving her 85-year-old mom Katharina to an exercise class in Calgary for people with osteoarthritis that she moved off the sidelines and began participating herself. “I thought, ‘I’m here anyway, and I have a little bit of osteoarthritis developing in my hips, so it can’t hurt, right?’” the 56-year-old Winkler recalls. And she’s glad she did. After completing the eight-week program, she reports decreased pain and better mobility. Called Good Life with osteoArthritis: Denmark (GLA:D), the program is currently offered in 39 clinics in 18 communities across the province. AHS partners with physiotherapy clinics and other trained and accredited providers to deliver the program. People who sign up for GLA:D receive information about osteoarthritis, managing symptoms, tips on handling difficulties with daily activities, and why and how exercise can help. Hour-long group exercise sessions teach participants proper posture and how to control movement; how to build muscular strength through functional exercises; and how to apply these exercises to everyday activities. 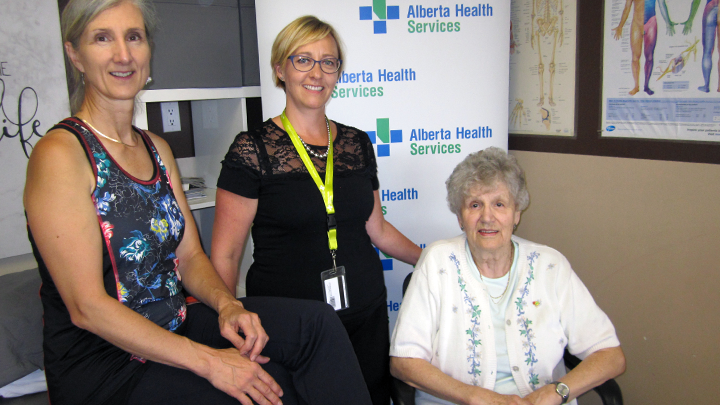 “Through the GLA:D program people with osteoarthritis can learn to gain some control over their chronic condition,” says Kira Ellis, Provincial Osteoarthritis Practice Lead with the Bone and Joint Health Strategic Clinical Network (SCN). “They can improve their own functional mobility and take steps to reduce their pain through exercise and lifestyle choices,” she says. GLA:D Canada reports a participant’s pain intensity decreased on average by 30 per cent, along with an increase in physical activity and improved quality of life. Close to three-quarters of participants said they used their new knowledge about osteoarthritis daily, and another quarter of participants used the information at least once a week. Paul Fitzpatrick, a 68-year-old Calgary man with severe arthritis in both knees, is an early proponent of the GLA:D program. He says he sees a surgeon once a year to determine if the time has come to look at knee replacement surgery. Fitzpatrick is a longtime vegan and former marathon runner who doesn’t have the added stress of any excess weight on his joints. He nevertheless still sees several benefits to the program. “It gives you a sense of control, the ability to manage your own condition,” he says. AHS piloted the program in 2017 through the Bone and Joint Health SCN. Other partners include Bone and Joint Canada, the Canadian Orthopaedic Foundation, the Alberta Bone and Joint Health Institute and The Arthritis Society. Learn more about the GLA:D program and find a location near you where the program is offered.